Tracy Brown enrolled at Earle C. Clements in February 2016. During his time at Job Corps, Tracy completed the business technology program, three semesters at Henderson Community College, and multiple community service projects. Do people ever feel the need to become someone in life after they have been knocked down constantly? Honestly, I can say that I am one of those people who have been knocked down several times and no matter what, I have always gotten back up. According to Roy T. Bennett, “It doesn’t matter how many times you get knocked down. All that matters is that you get up one more time than you were knocked down.” I am from Memphis, TN one of the impecunious cities in the United States. However, being in that type of environment is a severe struggle. I was able to use that struggle as motivation for success in life. 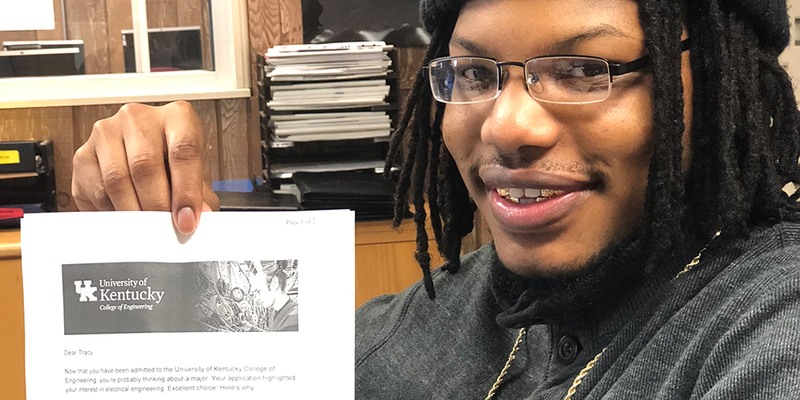 With the humble mentality and the vision that I have for the future, Earle C. Clements Job Corps Academy was able to help me set plans and goals in place for achievements. Earle C. Clements inspired me to become a better person in life and to remain humble when times get too difficult. Earle C. Clements is a training program where success starts. In order to become successful at Job Corps, students must first leave their old habits behind. Meaning, emptying out what people thought they knew and filling their cups with new knowledge. If students are open-minded and dedicated, Earle C. Clements is able to help students with employment, military, and college. For me, that was an eye-opening reason for motivation, determination, and dedication. During my time at the academy, I completed the business technology program, I became active on center doing center support, community service, and helping out in the dorm anytime staff needed me too. Living at Earle C. has made me a better person for the future. I admire the program and would recommend Earle C. to any person who is seeking a change in life.